The European Commission presented a proposal Tuesday for the sweeping expansion of Frontex, the EU border patrol agency. The proposal would give the agency the power to act as an autonomous border police that can operate contrary to the wishes of member states on whose borders it has been deployed. “We must strengthen Frontex considerably,” EU Commission President Jean-Claude Junker told the German radio station Deutschlandfunk . 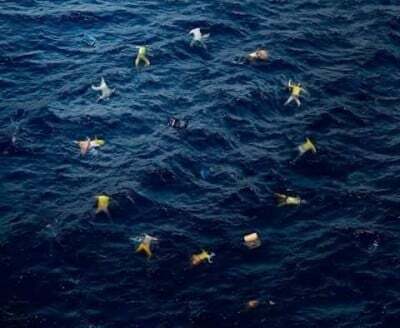 “Frontex must begin to operate as Europe’s coast and border protection force.” In a report to the European Parliament and the European Council, Junker laid out concrete plans for erecting a European Border and Coast Protection Agency (EBCG). Up to this point, Frontex has depended on border police and supplies from the EU member states. The new border protection troops will constitute a corps of 1,500 men who could be deployed in a matter of days. They will be designated “rapid intervention troops” and will have their own ships and helicopters. The Frontex headquarters in Warsaw will also be expanded and its staff increased from 400 employees to 1,000. Its budget will be nearly doubled to €280 million. When Frontex first began its work in 2005, the border protection agency had a budget of €19 million. This year the budget had already been expanded to €150 million. According to the commission’s plans, the EBCG will continually evaluate whether member states are in a position to secure EU external borders against refugees. If it comes to the conclusion that this is not the case, rapid intervention troops will be deployed at the relevant border. The decision on this issue is incumbent on the EU Commission, which the border protection agency entrusts “with the task of carrying out appropriate operational measures,” the commission recommendation states. “This will allow the Agency to intervene immediately in crisis situations by deploying European Border and Coast Guard Teams at the external border,” it continues. While previously, Frontex could only act on the request of the EU member states, the new agency will be deployed even against the will of member state governments. “In urgent situations, the Agency must be able to step in to ensure that action is taken on the ground even where there is no request for assistance from the Member State concerned or where that Member State considers that there is no need for additional intervention,” the proposal says. On the recommendation of the EU Commission, the ministerial council will come to a decision on the basis of a “reverse qualified majority.” This means that the recommendation will be accepted if three-quarters of the Member States do not explicitly oppose it. The proposal to expand the EU border guard is the result of pressure from the German and French governments. Frontex troops will be deployed mostly in Mediterranean countries such as Italy, Malta, Greece and Spain, as well as Eastern European countries such as Romania, Bulgaria, Poland and Hungary. Ten days ago, German Interior Minister Thomas de Maizière and his French counterpart Bernard Cazeneuve demanded the expansion of Frontex in a letter to the EU commission. “In exceptional cases, Frontex should also be able to take the initiative for the deployment of immediate response teams,” they said. De Maizière told Deutschlandfunk that if a national state did not effectively fulfil its external border protection responsibilities, these should be taken over by Frontex. Volker Kauder, president of the Christian Democratic Union/Christian Social Union parliamentary fraction, demanded in the die Zeit newspaper that national states entirely or partially give up their sovereign rights with regard to the movement of refugees. For example, “Greece is not in a position, either logistically or financially, to secure its borders,” he said. This situation will have to be fundamentally changed, he insisted. Protests from Warsaw and Budapest were even more explicit. Polish Foreign Minister Witold Waszcykowski rejected the commission’s plans on the radio station RMF, saying they would create an organisation that could arbitrarily make decisions about member states without giving them any voice in the process. The border troops have no democratic legitimacy, he insisted. Foreign Minister Peter Szijjarto made similar complaints and insisted that border control must remain a component of national sovereignty. Greek Prime Minister Alexis Tsipras also said that his government would not accept the stationing of EU border troops without the agreement of Athens, since border protection is a national affair. At the same time, he made it clear he would comply with the EU. “We must all understand that our international obligation regarding the Schengen treaty is to effectively contribute to the battle against terrorism,” he said. In order to accelerate deportation procedings, the proposal calls for the creation of a unified “European travel document.” The EU wants to push for the negotiation of a reacceptance agreement with countries of origin, so that the document will be recognised and asylum seekers can be deported with a minimum of fuss. The internment centres are already purposely in violation of international laws spelled out in the Geneva conventions, according to which every asylum seeker has the right to have his reason for flight considered and may not simply be rejected at the border. Refugees who do not come from Syria, Iraq or Afghanistan are already being denied this right in hot spots and on the Balkan route, on the grounds that they are supposedly economic migrants.